This a true randori situation ~ 1 nage ~ 4-5 ukes. Pay close attention to the attacks of the man in the white button down shirt. He is a very visible and committed uke that is completely unhinged in his aggressiveness throughout the video. This is the kind of attack aikido was meant for, and of course, he gets thoroughly trashed in a manner you could hardly imagine ~ without seeing the video. The other attackers are more cautious, and are delayed by effective management of ma-ai, and counter striking mostly. Of particular importance is nage’s management of distance (ma-ai), and his striking ~ parts of which are highlighted by the video editor. 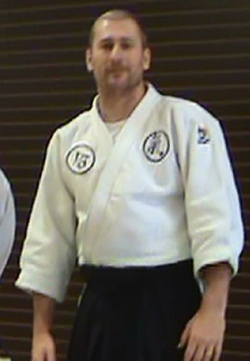 Note that while you don’t see clean examples of aikido technique, you do see exquisite aikido movement principles. Remember my premise: Movement is your best technique!